This week we had another Quilted Joy Clubhouse Live Meeting! Did you join us for the live broadcast? 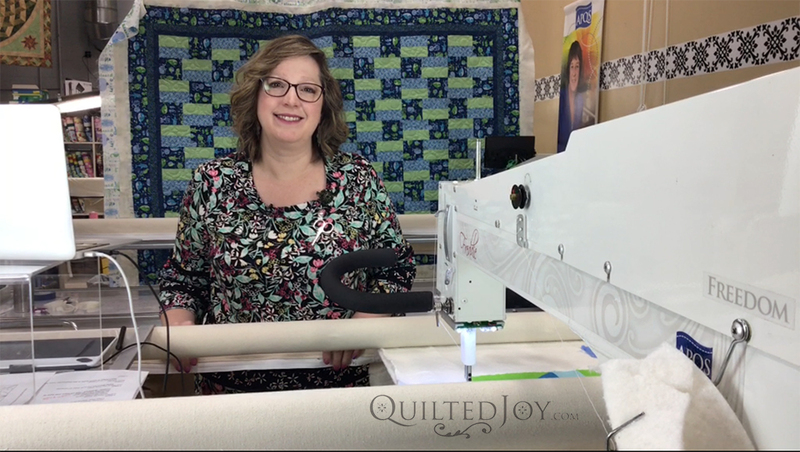 If not, or if you want to watch it again, you can now watch the video on the Quilted Joy Youtube channel whenever you’d like. Or you can watch it right here too! We had a bit of technical difficulties with the audio for the first few minutes. It helps when you remember to turn your mic on! 臘‍♀️I guess now you know this truly is a live video! Thanks to everyone who commented on the live video in the Quilted Joy Clubhouse Facebook Group and on Youtube to let us know the audio wasn’t working right. Once we realized what was going on we were able to fix it and the audio is much better through the rest of the video. Scratching your head wondering what the heck this Quilted Joy Clubhouse is? Click here to learn more about it! The program for this month’s meeting included many different ways to quilt a Half Square Triangle block. I see half square triangles in so many quilts, so I hope you can use some of the ideas I shared in the video on one of your next quilts. You can click here to get the Half Square Triangle Worksheet I was drawing on. This is a digital product, so to get the worksheet you’ll add it to your cart and checkout. The worksheet will be available for free until our next meeting on May 1. I have to say, I’m quite jealous of the sewing space Joanna shared during our lookie-loo segment. She has two separate rooms for all things quilty! One where her APQS Freddie lives and another for all things sewing and piecing. Thank you Joanna for letting us be nosey! For the My Favorite Things Segment I showed off some new wide back fabrics we’ve added to the shop this month. Tula Pink fans will be excited to see the Pinkerville 108″ quilt backings are here. We have two different color ways: Cotton Candy Pink and Daydream Blue. We also just added a fun white and black backing fabric from Windham fabrics called Be Mindful that I’m especially loving. The Quilted Joy Clubhouse Live Meetings will occur on the first Wednesday of every month at 1pm Eastern. Our next meeting will be on Wednesday May 1. During May’s meeting I’ll be showing different ways to quilt the Square in a Square block. If you’d like to watch live, you can find us on Facebook in the Quilted Joy Clubhouse or subscribe to the Quilted Joy Youtube channel to be notified about our videos. Don’t worry if you can’t join us live. The videos will remain available on both Facebook and Youtube afterwards so you can watch them whenever you want! Hope to “see” you at the next live meeting!